Demonstrators in Ecuador's oil-rich Amazonian region have agreed to a truce with the government, following days of protests that have crippled production. A delegation is preparing to travel to the capital Quito for talks, reports say. Protesters want some of Ecuador's oil money to be invested in the region. The army moved to regain control after hundreds in the two provinces occupied oil installations and airports. Venezuela has agreed to loan Ecuador oil until its industry stabilises. "We are going to help Ecuador," President Hugo Chavez said. "They will not have to pay a cent." The government declared a state of emergency on Wednesday, following four days of protests in Sucumbios and Orellana. Demonstrators want more of the country's oil wealth to be spent on infrastructure and new jobs. Ecuador is the fifth biggest oil producer in South America. A local official for Orellana said the week's protests were suspended "momentarily" for a dialogue. "But either we will have results from the talks or we will return to the previous measures," Guadalupe Llori said. The mayor of an oil town in Sucumbios said he thought state oil firm Petroecuador was ready to help with some of their requests. "The most important... is that it and the private oil companies operating in the area build roads and do more to reverse the environmental damage they have done," Edmundo Espindola said. The week's events have left dozens injured and brought the country's oil production to a halt. Petroecuador says it is slowly resuming crude oil production which was suspended from Thursday until Friday. The government said it faced an "economic emergency" as a result of the stoppage, which sent world oil prices higher. Ecuadorian officials estimate production will not return to normal until November. Correspondents say the unrest is the worst faced by President Alfredo Palacio since he came to power in April. They say he is under pressure at home to abandon the free-market policies of his ousted predecessor, Lucio Gutierrez. 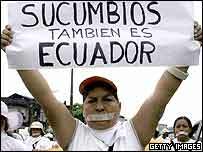 Not all sections of Ecuadorian society have benefited equally from oil revenues. The traditionally dominant Spanish-descended elite gained far more than the indigenous peoples, who make up a large proportion of those who live in poverty. Correspondents say revenues from the country's existing Amazon oil reserves are critical in keeping the country's economy afloat. Oil sales account for about a quarter of Ecuador's GDP. According to the president of the country's Petroleum Industry Association, oil revenues have been put towards paying for both state sector salaries and a significant amount of the national debt.